The path doesn’t have to be a straight line; it could also be a curve like the one in Fig. 13.10. By an argument similar to that in Section 7.1, this work depends on only the initial and final values of r, not on the path taken. 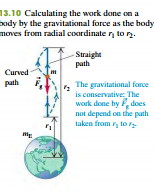 This also proves that the gravitational force is always conservative. You may be troubled by Eq. 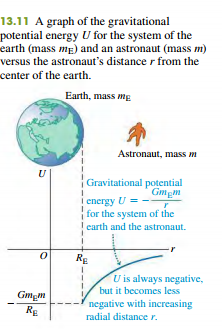 (13.9) because it states that gravitational potential energy is always negative. But in fact you’ve seen negative values of U before. In using the formula U = mgy in Section 7.1, we found that U was negative whenever the body of mass m was at a value of y below the arbitrary height we chose to be y = 0—that is, whenever the body and the earth were closer together than some arbitrary distance. (See, for instance, Example 7.2 in Section 7.1.) In defining U by Eq. (13.9), we have chosen U to be zero when the body of mass m is infinitely far from the earth 1r = ∞2. As the body moves toward the earth, gravitational potential energy decreases and so becomes negative. If we wanted, we could make U = 0 at the earth’s surface, where r = RE, by adding the quantity GmEm>RE to Eq. (13.9). This would make U positive when r 7 RE. We won’t do this for two reasons: One, it would complicate the expression for U; two, the added term would not affect the difference in potential energy between any two points, which is the only physically significant quantity. If the earth’s gravitational force on a body is the only force that does work, then the total mechanical energy of the system of the earth and body is constant, or conserved. In the following example we’ll use this principle to calculate escape speed, the speed required for a body to escape completely from a planet.